The ladies and gentlemen of Scout Creative (you might remember them from their previous incarnation, The Curiosity Group) have released another printable calendar of the month. 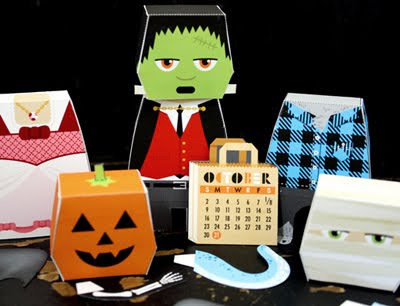 October's build-it-yourself edition features a collection of spooky heads, arms and bodies. Mix and match to make your own hideous little creature. Get it here! I see fun in Miss C's and my future! Thanks! Very cute! I love the Mummy one! Okay, those are just adorable! those are adorable. Might have to try it! life in the married lane - a little blog full of inspiration! What cute little monsters...love working with paper! Just a random note (I sent this to your email but I'm sure you get swamped!). I saw candles for sale on ModCloth using your fabric! Oops, sorry! I meant *lamps* not candles. Sooooo cute! I just love the Frankinstein! !